Syrian refugees fleeing the violence in their country make their way to a refugee camp in the Jordanian city of Mafraq July 31. 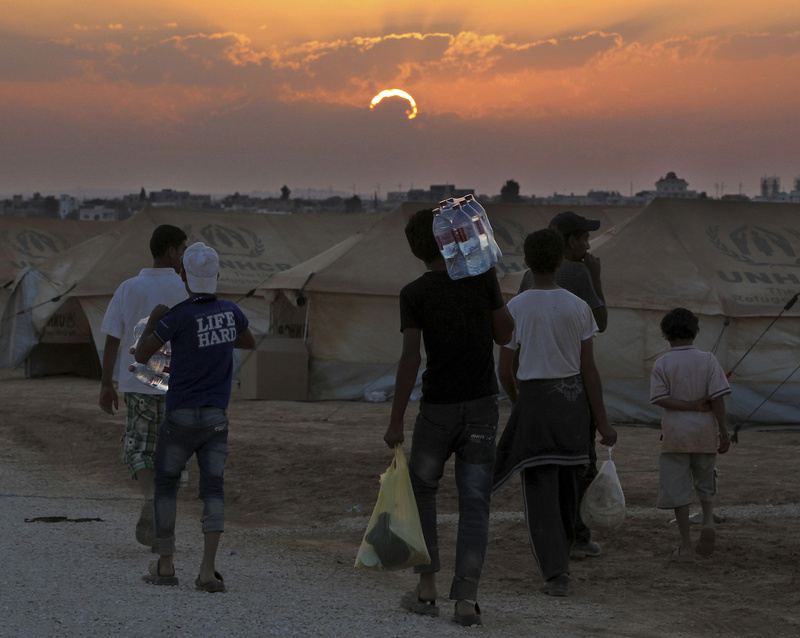 BEIRUT (CNS) — Refugees from Syria are in “complete darkness” about their future, said an official with Caritas Lebanon. Father Simon Faddoul, president of Caritas Lebanon, which has been working with Syrian refugees in Lebanon for 14 months, said there was a large influx of people during the last week of July as more than 20,000 refugees fled violence in Damascus and Homs. “The situation we are in at the moment is terrible. What tomorrow will bring? Unfortunately, we estimate a worse situation,” he told CNS. A Catholic Relief Services staff member chronicling the stories of refugees in border communities in Jordan and Lebanon found people fraught with concern for relatives and friends left behind as they were forced to flee the escalating violence with little advance notice. “People are feeling generally broken and that they might not ever become whole again,” Caroline Brennan, senior communications officer for CRS, said in a telephone interview from Beirut July 31. The United Nations said July 31 that there were 34,096 displaced Syrians receiving protection and assistance in Lebanon through the efforts of the government, the U.N. and nongovernmental partners. However, Father Faddoul said the number of refugees in Lebanon is much higher. “In my opinion, the unofficial numbers could be well over 100,000,” Father Faddoul said, pointing to the roughly 300,000 Syrian workers in Lebanon who have been bringing their families to the country as the situation in their homeland deteriorated. “They fear to talk or to be pictured. They are afraid to give their names to the UNHCR,” leaving many people unregistered, he said. Caritas distributed food kits, food vouchers, sheets and blankets and hygiene kits to refugees in Lebanon’s northern city of Tripoli, and the Bekaa Valley region, distributing nearly 13,000 items. Brennan said CRS was working with Caritas Jordan in providing food and distributing bedding, stoves, fans and hygiene kits in the northern Jordanian communities of Ibid, Mafraq and Zarqa. “What you see in those areas are people with war stories you don’t expect. Mothers showing bullet wounds under their dresses. Children drawing pictures in a clinic they should have no reason to draw,” Brennan said. “It is so raw for people right now. It is not what they expected to happen in their lifetime,” she added. Many refugees are facing psychological trauma, Father Faddoul said, citing the violence they experienced. “Someone who watched a family member being killed before their eyes … a woman who witnessed her husband being hanged … bombardment for three to four consecutive days … the stories are endless,” he said. The refugees face an uncertain future. Laura Sheahen, communications officer for Caritas Internationalis, visited Syrian refugees in sprawling tent camps near the Lebanese of city of Zahle in the Bekaa Valley July 31. The Syrians want the war to end quickly so they can return home and begin to piece their lives back together, both Father Faddoul and Brennan told CNS. “They are very attached to their homeland, their families,” the priest said.